Late antiquity is a periodization used by historians to describe the time of transition from classical antiquity to the Middle Ages in mainland Europe, the Mediterranean world, and the Near East. The popularization of this periodization in English has generally been accredited to historian Peter Brown, after the publication of his seminal work The World of Late Antiquity (1971). Precise boundaries for the period are a continuing matter of debate, but Brown proposes a period between the 3rd and 8th centuries AD. Generally, it can be thought of as from the end of the Roman Empire's Crisis of the Third Century (c. 235–284) to, in the East, the early Muslim conquests in the mid-7th century. In the West the end was earlier, with the start of the Early Middle Ages typically placed in the 6th century, or earlier on the edges of the Western Roman Empire. The Roman Empire underwent considerable social, cultural and organizational changes starting with the reign of Diocletian, who began the custom of splitting the Empire into Eastern and Western halves ruled by multiple emperors. Beginning with Constantine the Great, Christianity was made legal in the Empire, and a new capital was founded at Constantinople. Migrations of Germanic tribes disrupted Roman rule from the late 4th century onwards, culminating in the eventual collapse of the Empire in the West in 476, replaced by the so-called barbarian kingdoms. The resultant cultural fusion of Greco-Roman, Germanic and Christian traditions formed the foundations of the subsequent culture of Europe. The term Spätantike, literally "late antiquity", has been used by German-speaking historians since its popularization by Alois Riegl in the early 20th century. It was given currency in English partly by the writings of Peter Brown, whose survey The World of Late Antiquity (1971) revised the post-Gibbon view of a stale and ossified Classical culture, in favour of a vibrant time of renewals and beginnings, and whose The Making of Late Antiquity offered a new paradigm of understanding the changes in Western culture of the time in order to confront Sir Richard Southern's The Making of the Middle Ages. The continuities between the later Roman Empire, as it was reorganized by Diocletian (r. 284–305), and the Early Middle Ages are stressed by writers who wish to emphasize that the seeds of medieval culture were already developing in the Christianized empire, and that they continued to do so in the Eastern Roman Empire or Byzantine Empire at least until the coming of Islam. Concurrently, some migrating Germanic tribes such as the Ostrogoths and Visigoths saw themselves as perpetuating the "Roman" tradition. While the usage "Late Antiquity" suggests that the social and cultural priorities of Classical Antiquity endured throughout Europe into the Middle Ages, the usage of "Early Middle Ages" or "Early Byzantine" emphasizes a break with the classical past, and the term "Migration Period" tends to de-emphasize the disruptions in the former Western Roman Empire caused by the creation of Germanic kingdoms within her borders beginning with the foedus with the Goths in Aquitania in 418. The general decline of population, technological knowledge and standards of living in Europe during this period became the archetypal example of societal collapse for writers from the Renaissance. As a result of this decline, and the relative scarcity of historical records from Europe in particular, the period from roughly the early fifth century until the Carolingian Renaissance (or later still) was referred to as the "Dark Ages". This term has mostly been abandoned as a name for a historiographical epoch, being replaced by "Late Antiquity" in the periodization of the late West Roman Empire, the early Byzantine empire and the Early Middle Ages. One of the most important transformations in Late Antiquity was the formation and evolution of the Abrahamic religions: Christianity, Rabbinic Judaism and, eventually, Islam. A milestone in the rise of Christianity was the conversion of Emperor Constantine the Great (r. 306–337) in 312, as claimed by his Christian panegyrist Eusebius of Caesarea, although the sincerity of his conversion is debated. Constantine confirmed the legalization of the religion through the so-called Edict of Milan in 313, jointly issued with his rival in the East, Licinius (r. 308–324). By the late 4th century, Emperor Theodosius the Great had made Christianity the State religion, thereby transforming the Classical Roman world, which Peter Brown characterized as "rustling with the presence of many divine spirits." Constantine I was a key figure in many important events in Christian history, as he convened and attended the first ecumenical council of bishops at Nicaea in 325, subsidized the building of churches and sanctuaries such as the Church of the Holy Sepulchre in Jerusalem, and involved himself in questions such as the timing of Christ's resurrection and its relation to the Passover. The birth of Christian monasticism in the deserts of Egypt in the 3rd century, which initially operated outside the episcopal authority of the Church, would become so successful that by the 8th century it penetrated the Church and became the primary Christian practice. Monasticism was not the only new Christian movement to appear in late antiquity, although it had perhaps the greatest influence. Other movements notable for their unconventional practices include the Grazers, holy men who ate only grass and chained themselves up; the Holy Fool movement, in which acting like a fool was considered more divine than folly; and the Stylites movement, where one practitioner lived atop a 50-foot pole for 40 years. Late Antiquity marks the decline of Roman state religion, circumscribed in degrees by edicts likely inspired by Christian advisors such as Eusebius to 4th century emperors, and a period of dynamic religious experimentation and spirituality with many syncretic sects, some formed centuries earlier, such as Gnosticism or Neoplatonism and the Chaldaean oracles, some novel, such as hermeticism. Culminating in the reforms advocated by Apollonius of Tyana being adopted by Aurelian and formulised by Flavius Claudius Julianus to create an organised but short-lived pagan state religion that ensured its underground survival into the Byzantine age and beyond. Many of the new religions relied on the emergence of the parchment codex (bound book) over the papyrus volumen (scroll), the former allowing for quicker access to key materials and easier portability than the fragile scroll, thus fueling the rise of synoptic exegesis, papyrology. Notable in this regard is the topic of the Fifty Bibles of Constantine. Within the recently legitimized Christian community of the 4th century, a division could be more distinctly seen between the laity and an increasingly celibate male leadership. 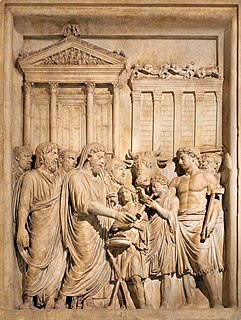 These men presented themselves as removed from the traditional Roman motivations of public and private life marked by pride, ambition and kinship solidarity, and differing from the married pagan leadership. Unlike later strictures on priestly celibacy, celibacy in Late Antique Christianity sometimes took the form of abstinence from sexual relations after marriage, and it came to be the expected norm for urban clergy. Celibate and detached, the upper clergy became an elite equal in prestige to urban notables, the potentes or dynatoi (Brown (1987) p. 270). Islam appeared in the 7th century and spurred Arab peoples to invade the Eastern Roman Empire and the Sassanian Empire of Persia, destroying the latter; and, after conquering all of North Africa and Visigothic Spain, to invade much of modern France. On the rise of Islam, two main theses prevail. On the one hand, there is the traditional view, as espoused by most historians prior to the second half of the twentieth century and by Muslim scholars. This view, the so-called "out of Arabia"-thesis, holds that Islam as a phenomenon was a new, alien element in the late antique world. Related to this is the Pirenne Thesis, according to which the Arab invasions marked—through conquest and the disruption of Mediterranean trade routes—the cataclysmic end of Late Antiquity and the beginning of the Middle Ages. On the other hand, there is the modern view, associated with scholars in the tradition of Peter Brown, in which Islam is seen to be a product of the Late Antique world, not foreign to it. This school suggests that its origin within the shared cultural horizon of the late antique world explains the character of Islam and its development. Such historians point to similarities with other late antique religions and philosophies—especially Christianity—in the prominent role and manifestations of piety in Islam, in Islamic asceticism and the role of "holy persons", in the pattern of universalist, homogeneous monotheism tied to worldly and military power, in early Islamic engagement with Greek schools of thought, in the apocalypticism of Islamic theology and in the way the Quran seems to react to contemporary religious and cultural issues shared by the late antique world at large. Further indication that Arabia (and thus the environment in which Islam first developed) was a part of the late antique world is found in the close economic and military relations between Arabia, the Byzantine Empire and the Sassanian Empire. The Late Antique period also saw a wholesale transformation of the political and social basis of life in and around the Roman Empire. The Roman citizen elite in the 2nd and 3rd centuries, under the pressure of taxation and the ruinous cost of presenting spectacular public entertainments in the traditional cursus honorum, had found under the Antonines that security could only be obtained by combining their established roles in the local town with new ones as servants and representatives of a distant Emperor and his traveling court. After Constantine centralized the government in his new capital of Constantinople (dedicated in 330), the Late Antique upper classes were divided among those who had access to the far-away centralized administration (in concert with the great landowners), and those who did not—though they were well-born and thoroughly educated, a classical education and the election by the Senate to magistracies was no longer the path to success. Room at the top of Late Antique society was more bureaucratic and involved increasingly intricate channels of access to the emperor: the plain toga that had identified all members of the Republican senatorial class was replaced with the silk court vestments and jewelry associated with Byzantine imperial iconography. Also indicative of the times is the fact that the imperial cabinet of advisors came to be known as the consistorium, or those who would stand in courtly attendance upon their seated emperor, as distinct from the informal set of friends and advisors surrounding the Augustus. The later Roman Empire was in a sense a network of cities. Archaeology now supplements literary sources to document the transformation followed by collapse of cities in the Mediterranean basin. Two diagnostic symptoms of decline—or as many historians prefer, 'transformation'—are subdivision, particularly of expansive formal spaces in both the domus and the public basilica, and encroachment, in which artisanal shops invade the public thoroughfare, a transformation that was to result in the souk. Burials within the urban precincts mark another stage in dissolution of traditional urbanistic discipline, overpowered by the attraction of saintly shrines and relics. In Roman Britain, the typical 4th- and 5th-century layer of "black earth" within cities seems to be a result of increased gardening in formerly urban spaces. Rome went from a population of 800,000 in the beginning of the period to a population of 30,000 by the end of the period, the most precipitous drop coming with the breaking of the aqueducts during the Gothic War. A similar though less marked decline in urban population occurred later in Constantinople, which was gaining population until the outbreak of plague in 541. In Europe there was also a general decline in urban populations. As a whole, the period of late antiquity was accompanied by an overall population decline in almost all Europe, and a reversion to more of a subsistence economy. Long-distance markets disappeared, and there was a reversion to a greater degree of local production and consumption, rather than webs of commerce and specialized production. Concurrently, the continuity of the Eastern Roman Empire at Constantinople meant that the turning-point for the Greek East came later, in the 7th century, as the Eastern Roman, or Byzantine Empire centered around the Balkans, North Africa (Egypt and Carthage), and Asia Minor. The degree and extent of discontinuity in the smaller cities of the Greek East is a moot subject among historians. 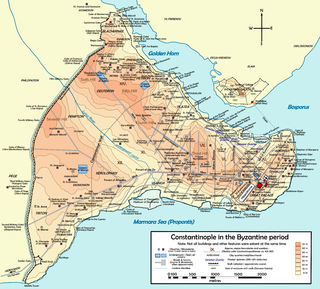 The urban continuity of Constantinople is the outstanding example of the Mediterranean world; of the two great cities of lesser rank, Antioch was devastated by the Persian sack of 540, followed by the plague of Justinian (542 onwards) and completed by earthquake, while Alexandria survived its Islamic transformation, to suffer incremental decline in favour of Cairo in the medieval period. Justinian rebuilt his birthplace in Illyricum, as Justiniana Prima, more in a gesture of imperium than out of an urbanistic necessity; another "city", was reputed to have been founded, according to Procopius' panegyric on Justinian's buildings, precisely at the spot where the general Belisarius touched shore in North Africa: the miraculous spring that gushed forth to give them water and the rural population that straightway abandoned their ploughshares for civilised life within the new walls, lend a certain taste of unreality to the project. In mainland Greece, the inhabitants of Sparta, Argos and Corinth abandoned their cities for fortified sites in nearby high places; the fortified heights of Acrocorinth are typical of Byzantine urban sites in Greece. In Italy, populations that had clustered within reach of Roman roads began to withdraw from them, as potential avenues of intrusion, and to rebuild in typically constricted fashion round an isolated fortified promontory, or rocca; Cameron notes similar movement of populations in the Balkans, 'where inhabited centres contracted and regrouped around a defensible acropolis, or were abandoned in favour of such positions elsewhere." 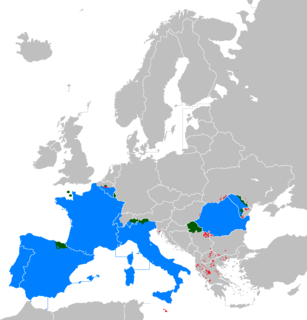 In the western Mediterranean, the only new cities known to be founded in Europe between the 5th and 8th centuries were the four or five Visigothic "victory cities". Reccopolis in the province of Guadalajara is one: the others were Victoriacum, founded by Leovigild, which may survive as the city of Vitoria, though a 12th-century (re)foundation for this city is given in contemporary sources; Lugo id est Luceo in the Asturias, referred to by Isidore of Seville, and Ologicus (perhaps Ologitis), founded using Basque labour in 621 by Suinthila as a fortification against the Basques, modern Olite. All of these cities were founded for military purposes and at least Reccopolis, Victoriacum, and Ologicus in celebration of victory. A possible fifth Visigothic foundation is Baiyara (perhaps modern Montoro), mentioned as founded by Reccared in the 15th-century geographical account, Kitab al-Rawd al-Mitar. The arrival of a highly urbanized Islamic culture in the decade following 711 ensured the survival of cities in the Hispaniae into the Middle Ages. Beyond the Mediterranean world, the cities of Gaul withdrew within a constricted line of defense around a citadel. Former imperial capitals such as Cologne and Trier lived on in diminished form as administrative centres of the Franks. In Britain, where the break with Late Antiquity comes earliest in the 5th and the 6th century, most towns cities had been in rapid decline during the 4th century during a time of prosperity until the very last decades of the century , well before the withdrawal of Roman governors and garrisons; historians emphasizing urban continuities with the Anglo-Saxon period depend largely on the post-Roman survival of Roman toponymy. Aside from a mere handful of its continuously inhabited sites, like York and London and possibly Canterbury, however, the rapidity and thoroughness with which its urban life collapsed with the dissolution of centralized bureaucracy calls into question the extent to which Roman Britain had ever become authentically urbanized: "in Roman Britain towns appeared a shade exotic," observes H. R. Loyn, "owing their reason for being more to the military and administrative needs of Rome than to any economic virtue". The other institutional power centre, the Roman villa, did not survive in Britain either. Gildas lamented the destruction of the twenty-eight cities of Britain; though not all in his list can be identified with known Roman sites, Loyn finds no reason to doubt the essential truth of his statement. Classical Antiquity can generally be defined as an age of cities; the Greek polis and Roman municipium were locally organised, self-governing bodies of citizens governed by written constitutions. When Rome came to dominate the known world, local initiative and control were gradually subsumed by the ever-growing Imperial bureaucracy; by the Crisis of the Third Century the military, political and economic demands made by the Empire had crushed the civic spirit, and service in local government came to be an onerous duty, often imposed as punishment. Harassed urban dwellers fled to the walled estates of the wealthy to avoid taxes, military service, famine and disease. In the Western Roman Empire especially, many cities destroyed by invasion or civil war in the 3rd century could not be rebuilt. Plague and famine hit the urban class in greater proportion, and thus the people who knew how to keep civic services running. Perhaps the greatest blow came in the wake of the extreme weather events of 535–536 and subsequent Plague of Justinian, when the remaining trade networks ensured the Plague spread to the remaining commercial cities. The end of Classical Antiquity is the end of the Polis model, and the general decline of cities is a defining feature of Late Antiquity. In the cities the strained economies of Roman over-expansion arrested growth. Almost all new public building in Late Antiquity came directly or indirectly from the emperors or imperial officials. Attempts were made to maintain what was already there. The supply of free grain and oil to 20% of the population of Rome remained intact the last decades of the 5th century. It was once thought that the elite and rich had withdrawn to the private luxuries of their numerous villas and town houses. Opinion has revised this. They monopolized the higher offices in the imperial administration. What they were removed from was military command by the late 3rd century. Their focus turned to preserving their vast wealth rather than fighting for it. The basilica which functioned as a law court or for imperial reception of foreign dignitaries became the primary public building functioned in the 4th century. Due to the stress on civic finances, cities spent money on walls, maintaining baths and markets at the expense of amphitheaters, temples, libraries, porticoes, gymnasia, concert and lecture halls, theaters and other amenities of public life. In any case as Christianity took over many of these building which were associated with pagan cults were neglected in favor of building churches and donating to the poor. 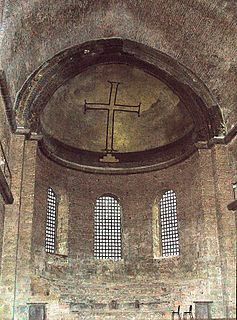 The Christian basilica was copied from the civic structure with variations. 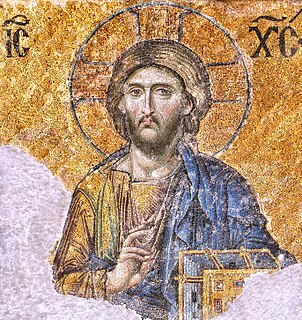 The bishop took the chair in the apse reserved in secular structures for the magistrate—or the Emperor himself—as the representative here and now of Christ Pantocrator, the Ruler of All, his characteristic Late Antique icon. These ecclesiastical basilicas (e.g., St. John Lateran and St. Peter's in Rome) were themselves outdone by Justinian's Hagia Sophia, a staggering display of later Roman/Byzantine power and architectural taste, though the building is not architecturally a basilica. In the former Western Roman Empire no great buildings were constructed from the 5th century. A most outstanding example is the Church of San Vitaly in Ravenna constructed circa 530 at a cost of 26,000 gold solidi or 360 pounds of gold. The collapse of city life in the East was delayed, though negatively affected by the plague in the 6th, until the 7th century and was result of Slavic invasions in the Balkans and Persian destructiveness in Anatolia in the 620s. City life continued in Syria, Jordan and Palestine into the 8th. In the later 6th century street construction was still undertaken in Caesarea Maritima in Palestine, and Edessa was able to deflect Chosroes I with massive payments in gold in 540 and 544, before it was overrun in 609. As a complicated period bridging between Roman art and medieval art and Byzantine art, the Late Antique period saw a transition from the classical idealized realism tradition largely influenced by Ancient Greek art to the more iconic, stylized art of the Middle Ages. Unlike classical art, Late Antique art does not emphasize the beauty and movement of the body, but rather, hints at the spiritual reality behind its subjects. Additionally, mirroring the rise of Christianity and the collapse of the western Roman Empire, painting and freestanding sculpture gradually fell from favor in the artistic community. Replacing them were greater interests in mosaics, architecture, and relief sculpture. As the soldier emperors such as Maximinus Thrax (r. 235–238) emerged from the provinces in the 3rd century, they brought with them their own regional influences and artistic tastes. For example, artists jettisoned the classical portrayal of the human body for one that was more rigid and frontal. 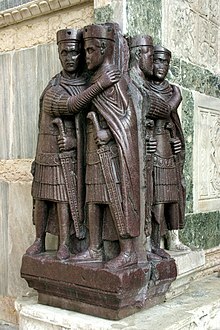 This is markedly evident in the combined porphyry Portrait of the Four Tetrarchs in Venice. With these stubby figures clutching each other and their swords, all individualism, naturalism, the verism or hyperrealism of Roman portraiture, and Greek idealism diminish. The Arch of Constantine in Rome, which re-used earlier classicising reliefs together with ones in the new style, shows the contrast especially clearly. In nearly all artistic media, simpler shapes were adopted and once natural designs were abstracted. Additionally hierarchy of scale overtook the preeminence of perspective and other classical models for representing spatial organization. From around 300 Early Christian art began to create new public forms, which now included sculpture, previously distrusted by Christians as it was so important in pagan worship. Sarcophagi carved in relief had already become highly elaborate, and Christian versions adopted new styles, showing a series of different tightly packed scenes rather than one overall image (usually derived from Greek history painting) as was the norm. Soon the scenes were split into two registers, as in the Dogmatic Sarcophagus or the Sarcophagus of Junius Bassus (the last of these exemplifying a partial revival of classicism). Nearly all of these more abstracted conventions could be observed in the glittering mosaics of the era, which during this period moved from being decoration derivative from painting used on floors and walls likely to become wet to a major vehicle of religious art in churches. The glazed surfaces of the tesserae sparkled in the light and illuminated the basilica churches. Unlike their fresco predecessors, much more emphasis was placed on demonstrating a symbolic fact rather than on rendering a realistic scene. As time progressed during the Late Antique period, art become more concerned with biblical themes and influenced by interactions of Christianity with the Roman state. Within this Christian subcategory of Roman art, dramatic changes were also taking place in the Depiction of Jesus. Jesus Christ had been more commonly depicted as an itinerant philosopher, teacher or as the "Good Shepherd," resembling the traditional iconography of Hermes. He was increasingly given Roman elite status, and shrouded in purple robes like the emperors with orb and scepter in hand. As for luxury arts, manuscript illumination on vellum and parchment emerged from the 5th century, with a few manuscripts of Roman literary classics like the Vergilius Vaticanus and the Vergilius Romanus, but increasingly Christian texts, of which Quedlinburg Itala fragment (420–430) is the oldest survivor. 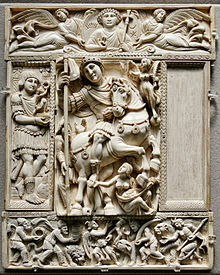 Carved ivory diptychs were used for secular subjects, as in the imperial and consular diptychs presented to friends, as well as religious ones, both Christian and pagan – they seem to have been especially a vehicle for the last group of powerful pagans to resist Christianity, as in the late 4th century Symmachi–Nicomachi diptych. Extravagant hoards of silver plate are especially common from the 4th century, including the Mildenhall Treasure, Esquiline Treasure, Hoxne Hoard, and the imperial Missorium of Theodosius I. 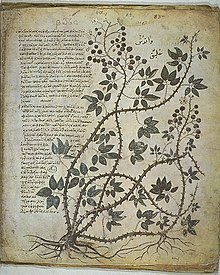 The Vienna Dioscurides, an early 6th-century illuminated manuscript of De Materia Medica by Dioscorides in Greek, a rare example of a late antique scientific text. In the field of literature, Late Antiquity is known for the declining use of classical Greek and Latin, and the rise of literary cultures in Syriac, Armenian, Georgian, Ethiopic, Arabic, and Coptic. It also marks a shift in literary style, with a preference for encyclopedic works in a dense and allusive style, consisting of summaries of earlier works (anthologies, epitomes) often dressed up in elaborate allegorical garb (e.g., De nuptiis Mercurii et Philologiae [The Marriage of Mercury and Philology] of Martianus Capella and the De arithmetica, De musica, and De consolatione philosophiae of Boethius—both later key works in medieval education). The 4th and 5th centuries also saw an explosion of Christian literature, of which Greek writers such as Eusebius of Caesarea, Basil of Caesarea, Gregory of Nazianzus and John Chrysostom and Latin writers such as Ambrose of Milan, Jerome and Augustine of Hippo are only among the most renowned representatives. On the other hand, authors such as Ammianus Marcellinus (4th century) and Procopius of Caesarea (6th century) were able to keep the tradition of classical historiography alive. Greek poets of the Late Antique period included Antoninus Liberalis, Quintus Smyrnaeus, Nonnus, Romanus the Melodist and Paul the Silentiary. Latin poets included Ausonius, Paulinus of Nola, Claudian, Rutilius Namatianus, Orientius, Sidonius Apollinaris, Corippus and Arator. Jewish poets included Yannai, Eleazar ben Killir and Yose ben Yose. 378: At the Battle of Adrianople, Eastern Roman Emperor Valens is defeated by Gothic rebels. 382: Influenced by Saint Amrose, Roman Emperor Gratian persecutes paganism, removing the Altar of Victory. 406: The Crossing of the Rhine by a confederacy of Germanic tribes marks a turning point in the Migration Period. 410: Alaric I sacks Rome for the first time since 390 BC. Final Roman departure from Britan. 476: Romulus Augustus, last Western Roman Emperor is forced to abdicate by Odoacer, a half Hunnish and half Scirian chieftain of the Germanic Heruli; Odoacer returns the imperial regalia to Eastern Roman Emperor Zeno in Constantinople in return for the title of dux of Italy; this marks the end of the Western Roman Empire and is often taken as marking the end of Classical Antiquity. 486: In the Battle of Soissons, Clovis I defeats the Roman rump state of Soissons, establishing Merovingian Francia. 634: The Battle of al-Qaryatayn marks the beginning of the Arab conquest of Syria. ^ Glen W. Bowersock, "The Vanishing Paradigm of the Fall of Rome" Bulletin of the American Academy of Arts and Sciences 49.8 (May 1996:29–43) p. 34. ^ The Oxford Centre for Late Antiquity dates this as follows: "The late Roman period (which we are defining as, roughly, AD 250–450)..."
^ Noel Lenski (ed. ), The Cambridge Companion to the Age of Constantine (Cambridge University Press, 2006), "Introduction". ISBN 978-0-521-81838-4. ^ A. H.M. Jones, Constantine and the Conversion of Europe (University of Toronto Press, 2003), p. 73. ISBN 0-8020-6369-1. ^ Robert Hoyland, 'Early Islam as a Late Antique Religion', in: Scott F. Johnson ed., The Oxford Handbook of Late Antiquity (Oxford 2012) pp. 1053–1077. ^ 'The changing city' in "Urban changes and the end of Antiquity", Averil Cameron, The Mediterranean World in Late Antiquity, AD 395–600, 1993:159ff, with notes; Hugh Kennedy, "From Polis to Madina: urban change in late Antique and early Islamic Syria", Past and Present 106 (1985:3–27). ^ H. R. Loyn, Anglo-Saxon England and the Norman Conquest (1962) 1991:. ^ Bibliography in Averil Cameron, The Mediterranean World in Late Antiquity, AD 395–600, 1993,:152 note 1. ^ Procopius, Buildings of Justinian VI.6.15; Vandal Wars I.15.3ff, noted by Cameron 1993:158. ^ According to E. A Thompson, "The Barbarian Kingdoms in Gaul and Spain", Nottingham Mediaeval Studies, 7 (1963:4n11). ^ José María Lacarra, "Panorama de la historia urbana en la Península Ibérica desde el siglo V al X," La città nell'alto medioevo, 6 (1958:319–358). Reprinted in Estudios de alta edad media española (Valencia: 1975), pp. 25–90. ^ a b Loyn 1991:16. ^ Robert L. Vann, "Byzantine street construction at Caesarea Maritima", in R.L. Hohlfelder, ed. City, Town and Countryside in the Early Byzantine Ear 1982:167–70. ^ M. Whittow, "Ruling the late Roman and early Byzantine city: a continuous history", Past and Present 129 (1990:3–29). ^ Kitzinger 1977, pp. 2–21. ^ Kitzinger 1977, p. 9. ^ Kitzinger 1977, pp. 12–13. ^ Kitzinger 1977, pp. 7–8. ^ Kitzinger 1977, pp. 15–28. ^ Kitzinger 1977, pp. 29–34. Henning Börm, Westrom. Von Honorius bis Justinian, 2nd ed., Kohlhammer, 2018, ISBN 978-3-17-023276-1. (Review in English). Averil Cameron et al. (editors), The Cambridge Ancient History, vols. 12–14, Cambridge University Press 1997ff. Arnold H.M. Jones, The Later Roman Empire, 284–602; a social, economic and administrative survey, vols. I, II, University of Oklahoma Press, 1964. Kitzinger, Ernst (1977). Byzantine art in the making: main lines of stylistic development in Mediterranean art, 3rd–7th century. Faber & Faber. ISBN 0-571-11154-8. Bertrand Lançon, Rome in Late Antiquity: AD 313–604, Routledge, 2001. Michael Maas (ed. ), The Cambridge Companion to the Age of Attila, Cambridge University Press, 2015. Ramsay MacMullen, Christianizing the Roman Empire A.D. 100–400, Yale University Press, 1984. Stephen Mitchell, A History of the Later Roman Empire. AD 284–641, 2nd ed., Blackwell, 2015. Michael Rostovtzeff (rev. P. Fraser), The Social and Economic History of the Roman Empire, Oxford University Press, 1979. Johannes Wienand (ed. ), Contested Monarchy. Integrating the Roman Empire in the Fourth Century AD, Oxford University Press, 2015. Wikimedia Commons has media related to Late antiquity. New Advent – The Fathers of the Church, a Catholic website with English translations of the Early Fathers of the Church. The history of Byzantine Greece mainly coincides with the Eastern Roman or Byzantine Empire. Greece in the Roman era describes the period of Greek history when Ancient Greece was dominated by the Roman republic, the Roman Empire, and the Byzantine Empire. The Roman era of Greek history began with the Corinthian defeat in the Battle of Corinth in 146 BC. However, before the Achaean War, the Roman Republic had been steadily gaining control of mainland Greece by defeating the Kingdom of Macedon in a series of conflicts known as the Macedonian Wars. The Fourth Macedonian War ended at the Battle of Pydna in 148 BC and defeat of the Macedonian royal pretender Andriscus. Spolia, repurposed building stone for new construction, or decorative sculpture reused in new monuments, is the result of an ancient and widespread practice whereby stone that has been quarried, cut, and used in a built structure, is carried away to be used elsewhere. The practice is of particular interest to historians, archaeologists and architectural historians since the gravestones, monuments and architectural fragments of antiquity are frequently found embedded in structures built centuries or millennia later. Dame Averil Millicent Cameron, often cited as A. M. Cameron, is professor emerita of Late Antique and Byzantine History at the University of Oxford, and was formerly the Warden of Keble College, Oxford, between 1994 and 2010. The praefectus urbanus, also called praefectus urbi or urban prefect in English, was prefect of the city of Rome, and later also of Constantinople. The office originated under the Roman kings, continued during the Republic and Empire, and held high importance in late Antiquity. The office survived the collapse of the Western Roman Empire, and the last urban prefect of Rome, named Iohannes, is attested in 599. In the East, in Constantinople, the office survived until the 13th century. various mystery religions, such as the Dionysian and Eleusinian Mysteries and the mystery cults of Cybele, Mithras, and the syncretized Isis. Ernst Kitzinger was a German-American historian of late antique, early medieval, and Byzantine art. The legacy of the Roman Empire includes sets of cultural values, religious beliefs, technological advances, engineering and language. This legacy survived the demise of the empire itself and went on to shape other civilisations, a process which continues to this day. The city of Rome was the civitas and connected with the actual western civilisation on which subsequent cultures built. The Tyche of Constantinople was the deity of fortune (Tyche) who embodied the guardianship (tutela) of the city of Constantinople in the Roman Imperial era. Malalas says that her name was Anthousa. Her attributes included the mural crown, cornucopia, a ship's prow, and a spear. She was depicted standing or seated on a throne. As the personification of the city, Tyche or Anthousa could be abstracted from her origins as a Classical goddess, and like Victory made tolerable as a symbol for Christians. Under Constantine, the Tychai of Rome and Constantinople together might be presented as personifications of the empire ruling the world.